In this post I’ll describe a mechanism to manage nhibernate session following the widely known patter “session-per-request”. A single Session and a single database transaction implement the processing of a particular request event (for example, a Http request in a web application). The only purpose of the implementors is to store and retrieve the current session from somewhere. This class is used by the SessionFactory of nhibernate when calling the method GetCurrentSession(). They are pretty similar but the one inside uNhAddins supports multi-session-factory scenarios. Where do we init & store the session? Ayende already talked about this in his blog. But the problem is that he only wrote about the Session which is really light to instantiate. The problem is how do we handle the scope of the transaction which is not so light? Use BeginRequest/EndRequest to open/close the session. Handle the transaction with AOP – attributes. I am not sure but I think this is the case for the AutoTransaction facility of castle. 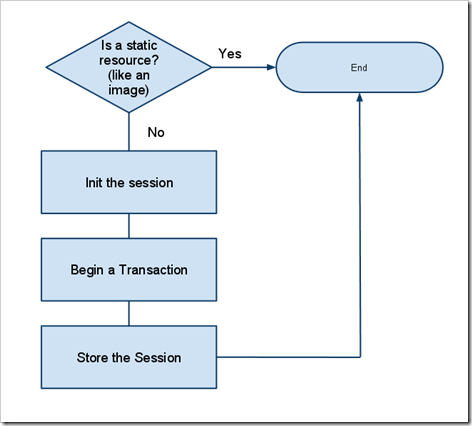 To use Asp.Net MVC ActionFilters to Open/Close the session and the transaction. There is a third which is an antipattern; using implicit transactions for most of the cases and explicit for some others. The main problem with these approaches is that you need to explicitly put something to say that some piece of code will use a session/transaction. Even if you do it with AOP! My new solution is to store a Lazy<ISession> per request instead of an ISession. Initialize in the first usage and finalize in the EndRequest – only if it was used/opened. The implementation I’ll show also support multi-session factories. /// Retrieve the current session for the session factory. /// Bind a new sessionInitializer to the context of the sessionFactory. /// Unbind the current session of the session factory. /// Provides the CurrentMap of SessionFactories. /// If there is no map create/store and return a new one. You can see here how we bind to the Lazy to the current context and the initializer. The BeginSession method initializes a session and a transaction. The UnBind method returns a session only if the Lazy was initialized. If it returns something we properly commit the transaction and dispose the session. I didn't write an implementation for ISessionFactoryProvider because I’m using castle typed factories. This will work out of the box with castle typed factories, following the pattern Get[Dao component name]. With other containers you will have to implement the interface. Remember also that NHibernate lets you name your session factory through the configuration, that is sometimes useful. How to use the ISession from my code? The lifestyle of the Dao is not tied to the Session. It could be even singleton. In winforms; for use with the pattern Conversation per Business transaction. It is up to you to choose the combination. For instance when doing WCF that will run inside iis, you can use the operationbehavior + web. But when you do WCF out of IIS, you can use OperationBehavior + PerThread. The important thing about this is that your DAOs are exactly the same despite the management you use. -For non-.Net 4 projects; as Richard Birkby points out you can use the Lazy<T> inside Mono. This code is not going to be in uNhAddins for now. You can copy&paste all the code from this gist.